I’ve got solar panels, what happens when I need to replace my roof? Five years ago when you decided to install solar panels in your home, the roof seemed fine. But now there’s a leak and other repairs that must be made, and they’re in an area under the solar system. What to do? It’s a conundrum that may arise if you have solar power supplying your electricity. According to the National Association of Home Builders (NAHB), asphalt shingle roofs — by far the most popular roofing material — last about 20 years. If you haven’t put the solar panels yet, they recommend that if your roof is more than five years old, you should consider having a professional evaluation done before going ahead with the installation. If your roof is nearing the end of its projected lifespan or is in poor condition, such as showing signs of crumbling, cracking, or curling, or maybe there are water stains on interior walls, then you are typically better off replacing it before installing solar panels. This ensures your roof will be able to support the solar panels, which weigh about the same as adding a second layer of shingles, and keeps you from having to pay to take down the panels when it comes time to replace the roof and re-install them after the new roof goes on. If the solar system is already up and running, you’ll have to lift the panels to let the roofer do his job. But the roofer shouldn’t be the one popping off the solar system. To avoid breaks or incorrect re-installations that could negatively impact electricity production or technical problems, a professional installer needs to take down the panels and re-install them later. If you are leasing the system, this should be covered in the contract. Even if you bought it, the company that installed the solar panels might be the best option to call, or there could be a stipulation in the contract about this. Again, read the agreement to see if there are any provisions for these scenarios or give them a call to discuss the issue directly with them. Maybe they’re willing to offer a discount for the work, if it’s not covered in the contract. 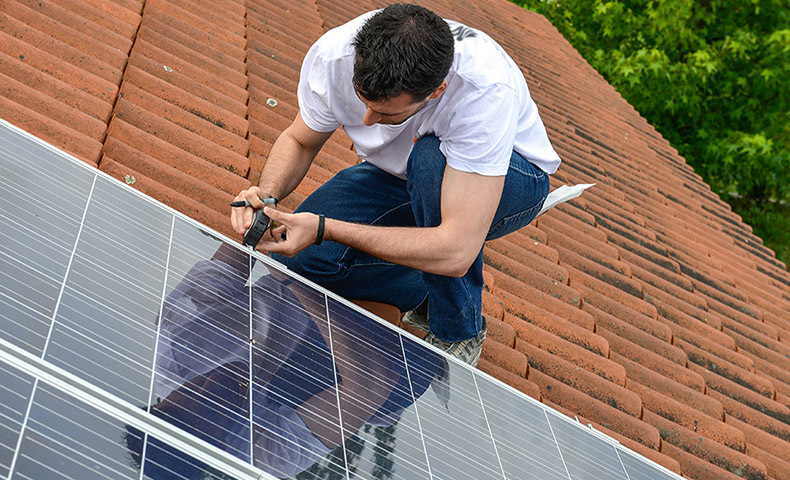 In addition, some solar installation companies also offer roof replacement services. Dealing with one company for your solar and roofing needs will save you time and money. 2. Once all the parts are disconnected, they must be unbolted from the rack or other mounting device without damaging either physical connections (bolts and hardware) or electrical connections (wires and connectors). 3. The racking and other mounting hardware must be removed from the roof. 4. Some work may also have to be done on your home’s electrical system, to make sure everything is safe while the panels are off the roof. 5. Once the new roof is put in place, the solar panels and other rooftop equipment will have to be installed just as if you were getting solar at home for the first time. The process will usually last two days: one for removing the solar panels and another day to replace them. Obviously, this depends on how large your solar system is and the configuration of your roof. The steeper the roof, the more time and labor required in removing the solar panels. Taking care of those solar system parts is paramount once they are removed. While solar panels do not weigh much, they contain hundreds of sensitive electrical connections and circuits that can be easily damaged if not handled properly. Provided you have ample, safe space in your property, the panels may be left there. If not, the remover will probably have to place them in storage. This might be a good time to do some maintenance on the solar system, if you’ve noticed any diminishing power. Maybe your panels need a good cleaning prior to re-installation. But don’t let these eventualities keep you from turning to renewable solar energy. The installation of solar panels in a home typically saves a homeowner tens of thousands of dollars over the lifetime of the system. Re-roofing costs can be high, but the savings of going with the power of the sun definitely outweigh that in the long run. And once the solar panels are back online on your roof, they are still covered by the warranty.